It is axiomatic for Buddhists that (so-called) Buddhism is an atheistic religion, though many academics will point out that the actions and attitudes of some Buddhists are practically indistinguishable from theism. Buddhism is an English term coined in the 19th century for people who follow the Buddha. The original followers called themselves savaka (the hearers) sakkaputta (Children of the Śakyan - the Buddha being a Śakyan by birth). The modern Indian term would be Bauddha, a collective noun along the lines of Śaiva (a follower of Śiva) and Jaina (a follower of the Jina). The Buddhist relationship with gods is in fact quite complex. Throughout the Pāli canon gods of various sorts appear and at times are major players. Where would Buddhists be for instance is the Vedic creator god Brahmā (in the form of Brahmāsahampati) had not begged the Buddha to pass on what he learned under the Bodhi Tree? Indra is another Vedic god who plays important roles in many suttas and jātaka stories - though usually under his alias Sakka (Sanskrit Śakra). Early Buddhism was also cognisant of local deities. Hardly a page of the canon goes by without mention of yakkhas (Sankrit yakṣa) or nāgas for instance. Yakṣas are local chthonic deities who were worshipped in the villages by the ordinary people - such people were sometimes referred to by the Buddha as superstitious (maṅgalika). Then there are the Four Great Kings (Cattāro Mahārājāno) who also appear regularly. Some of them share names with the legendary figures, there is a king Dhṛtarāṣṭra in the Mahābhārata for instance. All of these gods are shown as paying obeisance to the Buddha, and even his disciples. One of my favourite episodes from the Pāli canon is when Sāriputta goes home to see his orthodox Brahmin mother Sārī (Sāriputta means son of Sārī). She is scathing of him, his lifestyle and his friends and heaps abuse on them. (Nyanaponiika and Hecker, p.34) Later when he is very ill he visits her again and during the night he is visited by the Four Kings, Sakka and Mahābrahmā in turn, all of them wishing to wait on Sāriputta. Sāri is stunned to think that her son is being waited on by the gods she worships. Now she is receptive, Sāriputta gives her a Dhamma lesson and she attains to stream-entry (a state almost always reached by through hearing a dhamma lesson in the Canon ). The Kāraṇḍavyūha Sūtra introduces a new theme - the conversion of deities. Previously the gods just naturally seemed to pay obeisance to the Buddha, but in this text (from ca. 4th century CE) the god Śiva is converted to Buddhism by Avalokiteśvara. As far as I know there is no definite mention of Śiva in the Pāli texts. Studholme's tentative dating is supported by the appearance of Śiva on the scene since it coincides with the earlier dates suggested for the dominance of the Indian pantheon by Śiva. It is perhaps no coincidence that around this time Avalokiteśvara begins to assimilate Śiva's iconography and his name changes to be more like Śiva as well: from Avalokitasvara to Avalokiteśvara: ie from Avalokita + svara (Regarder of cries); to Avalokita + īśvara (Lord who looks down). 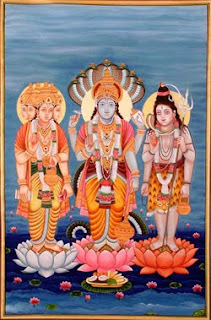 Īśvara is an important epithet of Śiva. I have noted before how the former name (Kwan Yin in Chinese) tends to be retained in China because it was quite firmly established in Kumarajīva's translation of the White Lotus Sūtra (Sadharmapuṇḍarikasūtra) in the 4th cent. However this conversion seems not to have stuck because in the late 7th century the Tantric text Sarvatathāgata-tattvasaṅgraha features a violent confrontation between Vajrapāṇi and Śiva - who here is called Maheśvara (mahā + īśvara; Great Lord). Śiva in this case refuses to submit, and in the end Vajrapāṇi slays him with a mantra, then revives him only to place his foot on Śiva's throat until he converts to Buddhism. Tantric art often shows Vajrapāṇi trampling on Śiva. Tantric Buddhism absorbed many Vedic and Hindu deities into it's pantheon and in particular they reinvigorated the worship of Agni through the various fire rituals (Homa). So it seems clear that at all stages of it's development Buddhism acknowledged the existence of gods, or at least appears to have acknowledged the belief in gods. Ancient Indian Buddhists did not try to disprove the existence of gods as do today's atheists. However at every turn they are shown as inferior to the Buddha, and to Buddhists. Buddhists also mock the gods as inferior - the Kevaddha Sutta - DN 11 where Brahma is pretending to be an omnipotent god but cannot answer the Buddha's question and begs the Buddha not to show him up in front of the other gods. If we followed the pattern we would simply acknowledge that Jehovah/Allah is a god, but point out the inconsistencies in the stories about him, and show why he is inferior to the Buddha - which should not be hard: the creator of samsara is clearly a terrible bungler. Design? Perhaps. Intelligent design? Pull the other one! The politics of the time might make this a little more dangerous for us than it was in the past with so many people willing to kill people for the crime of mockery. But mockery is developed to a high art in the UK and no one - not the Queen, the Prime Minister, the Archbishop of Canterbury nor even your best friend, and especially not one's self - is exempt. No one here can afford to take themselves too seriously! Indeed strident atheists are seen as just as reprehensible as strident religious fundamentalists. The Dictionary of Pāli Names is a very useful source for references to gods. See for instance: Sakka. Note that Peter Masefield, in his book Divine Revelation in Pali Buddhism, argues that this attainment could only take place in the presence of a Buddha. This is yet another example that the assertion is erroneous. See also my review. It is something to reflect on however, that stream-entry is almost always reached through listening to and reflecting on the dhamma, not through meditation. On Sirī see Rhys Davids, T.W. 1903. Buddhist India. p.216ff. Nyanaponika and Hecker, Hellmuth. 1997. Great Disciples of the Buddha. Wisdom Publications. Studholme, Alexander. 2002. The Origins of oṃ maṇipadme hūṃ: A Study of the Kāraṇḍavyūha Sūtra. State University of New York Press. 65% of American Buddhists believe in a god of some kind, another 10% are agnostic. 20% believe in a personal god. This suggests that we need to revisit the idea that Buddhists do not believe in god. Clearly many Buddhists do believe in god. The problem for Modernist Buddhism is how to square that with our Scientific Rationalism. That Buddhism is a-theist is not a trivial proposition for most Modernist Buddhists in the developed world.